This restaurant in Greenwich Village is highly lauded, and asserts on its website a special dedication to organic and local ingredients. It's a bugger to find - Downing Street is dark, and there's no visible restaurant sign. Eventually we counted back street numbers from the corner and punted for the dark doorway that opens into their dark reception area. As seems routine, the table wasn't quite ready so we started with cocktails at reception. I had a Mas Manhattan, like a normal Manhattan with some vanilla. Lynda had a grapefruit cocktail with salted rim, which was quite good. They do a tasting plate as a 4 or 6 course, but we'd had a substantial lunch and weren't inclined to eat long or even order the appetiser. The appetisers were either ordinary or really expensive - $70 for caviar wasn't going to happen. OTOH, we were slugged $12 each for sparkling water in our incautious reliance on recommended retail. Chef opened our tastebugs with an amuse-bouche of a creamy pea nibble, which did the job. Slightly consternated that we'd skipped appetisers , the staff brought out a chilled strawberry soup to tide us over until the mains arrived. The home-made bread and butter was very tasty; it'll be hard going back to Helgas. It was a little odd, but the staff came out in pairs every time to clear plates or bring dishes. It's obviously a Thing. Our neighbours were celebrating a birthday, so Birthday Guy got a little cupcake with a candle while two people wished him the best. The menu is a bit sparse, but changes daily. 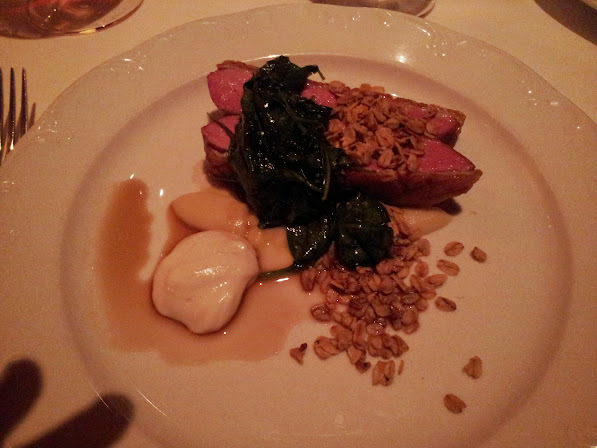 I went for the roasted duck breast with toasted oats, which was excellent. Lynda chose the lobster, which was good too. The restaurant's wine list was very top-end, but for some reason they had Chassagne-Montrachet by the glass at a reasonable price so we chose to go that way. Sweets with a dessert wine (strawberry tart for me, warm biscuit for Lynda) was a luxurious extravagance, and we agreed that chef Galen Zamarra had done very well indeed. Both the artistry and the overall taste experience showed he'd been well trained at Bouley restaurant. I think Mas was a photo finish with Blue Hill for the best NYC taste experience after Bouley.